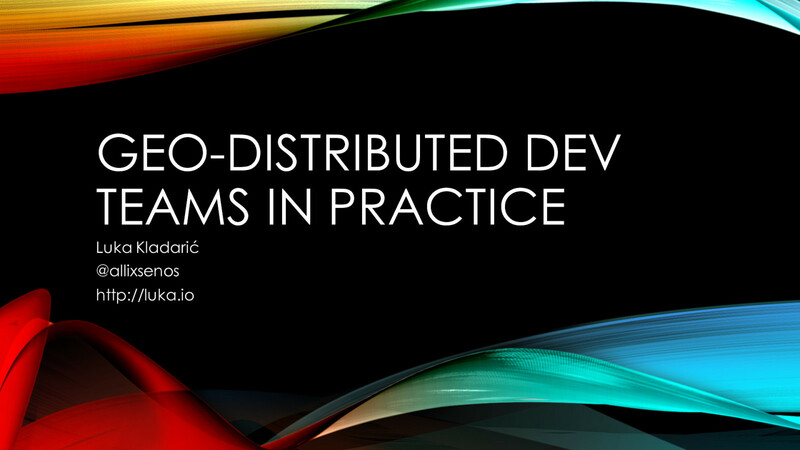 View Geo-distributed Development Teams in Practice. "Oh yeah, you must be way cheaper for them!" "But... how do they know you're actually working when you're remote?" "Oh I could never do that, my productivity tanks when I work from home." These are just some of the things I regularly hear when the topic of telecommuting, "remoting", "working from home" or similar comes up. After over a decade of working and hiring remotely, let me take you on a retrospective of my experiences; what works, what definitely doesn’t, the pros and cons, how to hire remotely and how to get hired. "What if everyone is in one office, and you're all alone on the other side of the planet?" "But I like hanging out with the people in my office, why would I give that up?" Can you go all-in with geo-distributed development and have no developers in the office? Can you go a step further and not even have an office? Do hybrid setups work at all? Oh, we have much to talk about.